Images & Tehcnical Doc sent by Robert Govier. - While we've been pointing that pioneers like James Grogono and posterior likewise solutions have achieved incredible efficiency and stable flights, it was only until Team New Zealand launched the now defacto racing foiling setup, that Multis could start flying while course racing, they even won Americas Cup 34th. Following the stable flight goal Michele Petrucci went for the double wand system a la Moth in the Stunt 9. And two UK projects followed suit. 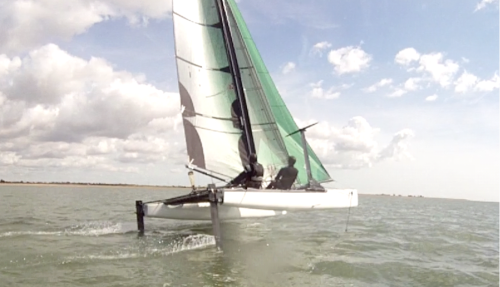 The custom Whisper UK foiler we featured weeks ago, and this new M20 from Sunnucks. That combines TNZ & Stunt 9 methods on raising the windward pivotal foil. All are surely achieving stable flights, something that Grogono did with Icarus, and even the Mayfly, but all these ideas are yet to be tested in racing and all are comprised by complicated wand, or pivotal systemz and a high degree of drag in calm winds compared to the TNZ, FP, Nacra 20 conf. That also beats them in simplicity.